The Walgreens Orlando International Dragon Boat Festival pays homage to the traditional water-sport festivals which originated with the Ancient Chinese. In Chinese custom, a dragon represents wisdom and is a powerful symbol of spring rain and growth. Disney World created this fun event in 2008 to inspire guests to refresh their mind and body in both amusement and health. Recently this event was honored with the "Best Single Sport Event Award" at the SportsTravel Awards. Epcot's Morocco Pavilion is home to some of the most beautiful artworks in all of World Showcase. The first major expansion of World Showcase, King Hassan II actually sent his personal artisans to see to the architecture and to design and create the many intricate zellij mosaics. The Victoria Gardens can be found at Epcot in the Canada Pavilion. Guests stroll through it after exiting O' Canada! and admire it charming the sides of the walkway that leading to Le Cellier Steakhouse. In my opinion it's one of the prettiest spots in all of Epcot and maybe even all of Walt Disney World. Yet, set down and back away from the World Showcase promenade as it is, many people walk right by. They say everything old becomes new again, and that's certainly the truth when it comes to fashion. 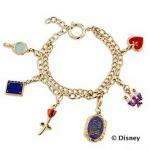 One of my favorite childhood treasures is coming back strong all over Disney Parks, the charm bracelet! UPDATE: This venue is no longer offered as a Disney Fairy Tale Weddings Option. Brides with a sense of rustic style can run away for a happily ever after that begins on the Sunrise Terrace at Disney's Wilderness Lodge. Belonging to the intimate 'Escape' collection of Disney Fairytale Weddings, this petite venue accommodates just 10 people for a ceremony with a spectacular view of Bay Lake. Today is Labor Day and we're celebrating the Disney Cast Members that make our Walt Disney World Vacations so very special with a look at a Cast Member tradition that goes back to Disneyland in 1963. I'm talking about the annual two-week event that is Canoe Races of the World (commonly referred to as C.R.O.W.) held in the Magic Kingdom, and in Disney Parks around the globe. Disney Cruise Line guests clamor for all the time they can get relaxing and enjoying the Caribbean air on DCL's private island, Castaway Cay. When not soaking up the sun or enjoying a meal of delicious BBQ, one of the most popular activities with island guests is the exciting opportunity to swim and interact with Southern Stingrays in a private lagoon. The design of Epcot's Italy Pavilion was created to showcase hallmarks of Italian architecture. The pavilion is modeled after St. Mark's Square in Venice with the large tower in the central plaza representing a one-fifth scale model of the 'Campanile di San Marco', the Bell tower of St Mark from the classic Italian city of Venice. The Canada Pavilion at Walt Disney World's Epcot is home to three native totem poles. Disney says that these totem poles are "authentic examples of Northwestern Native American "family trees." However, the two original poles located in the pavilion towering high in the air are fiberglass and were designed by Imagineers to capture the spirit of the Pacific Northwest. Since 1958 tours of the Disney Parks have been a part of the premier service that Walt wanted to offer to his guests. Today Walt Disney World offers a broad variety of specialized tours from a quick look 'Behind the Seeds' (1 hour) to a full day of 'Backstage Magic' (8 hours). Friendly plaid clad tour guides enchant and entertain guests from all over the world while pointing out spots of interest and sharing elusive details of the Parks.